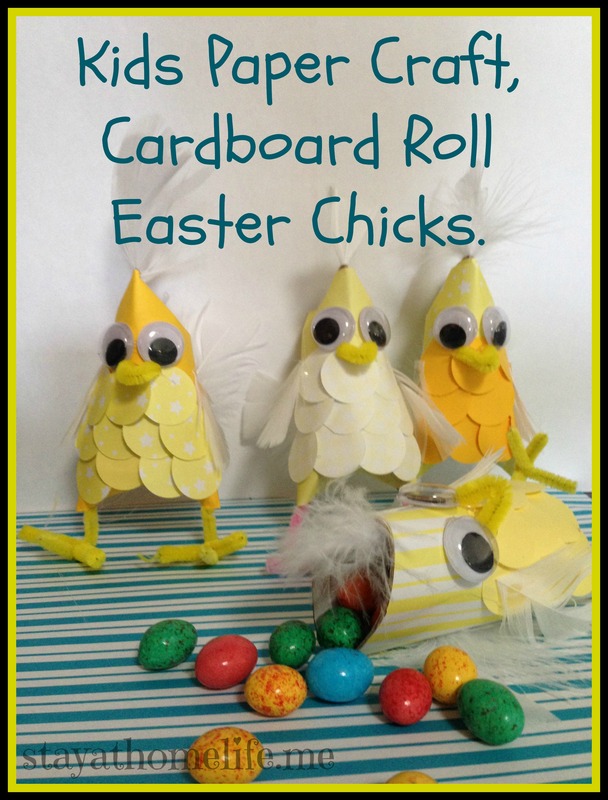 Cardboard Roll Easter Chicks – Kids Easter Craft. I’d like to say I came up with this all on my own, but that would be a lie. Ms5 and I made some owls inspired by this post from Kerrys Craft Blog. It was from this concept that I came up with these easter Chicks. I thought the fact you can hold eggs or treats in them was ideal for an easter craft project. All you need is some coloured paper, cardboard rolls, tape and glue. 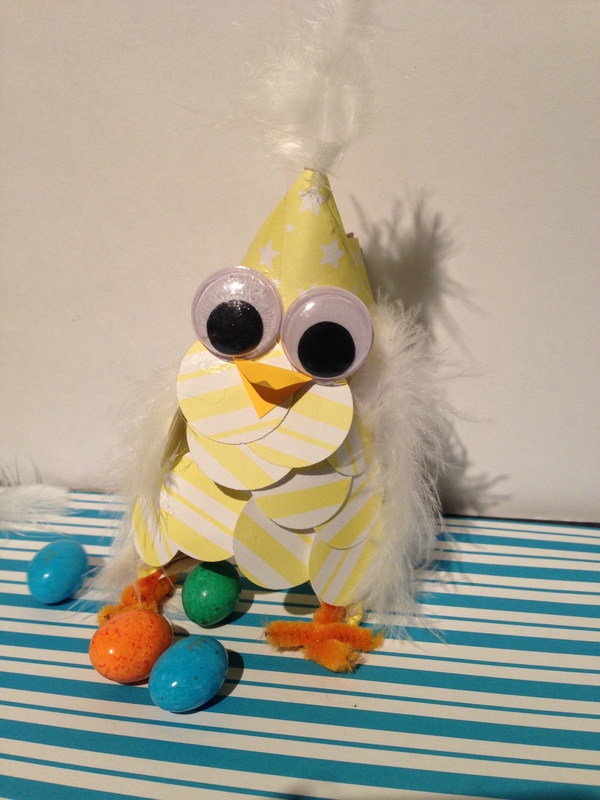 You can make them just as cute without the feathers, goggly eyes and pipe cleaners, but if you have some of those handy, you could use them like we did too. The main difference between these and the owls is that the top and bottom folds are in opposite directions to each other, so the head comes to a peak in the middle rather than making two ears like the owls have. The rest of the instructions can be found by running your curser over or clicking on the photos below. This is how you fold the ends in, but first, cover your roll with coloured paper. If you are adding legs, secure them in before folding the bottom in, with tape or hot glue. Attach the head feather to the inside of the top of the roll before folding it in. Ms5 cutting out the paper circles using a 1″ punch. Starting at the bottom, run some glue or double sided tape along and attach your first row of paper circles. Work your way up in layers with the paper feathers then attach eyes and a beak. We made this beak from pipe cleaner, but paper looks good too. Cut down some feathers to make little wings. We also attached a tail to the back. Cut a small sec on of pipe cleaner then twist it around let to make a foot shape. Fill with eggs or just use as decorations. 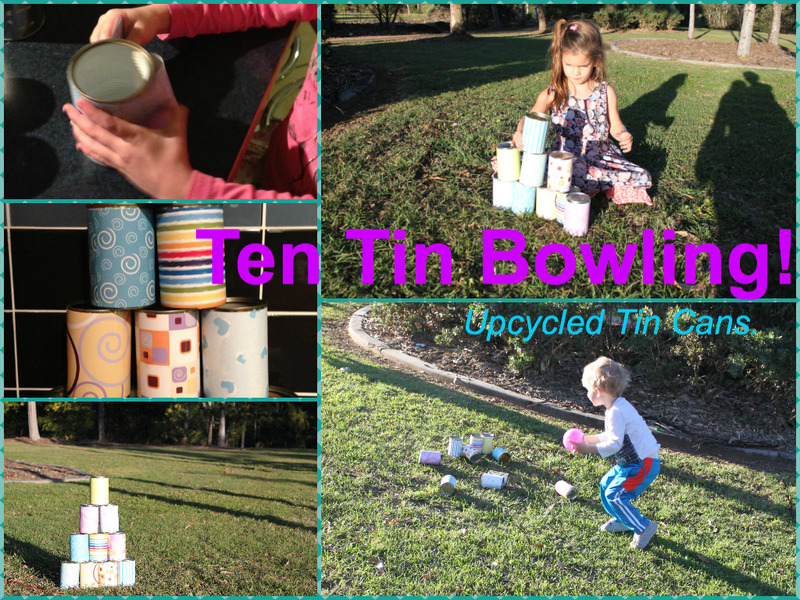 Ten Tin Bowling! 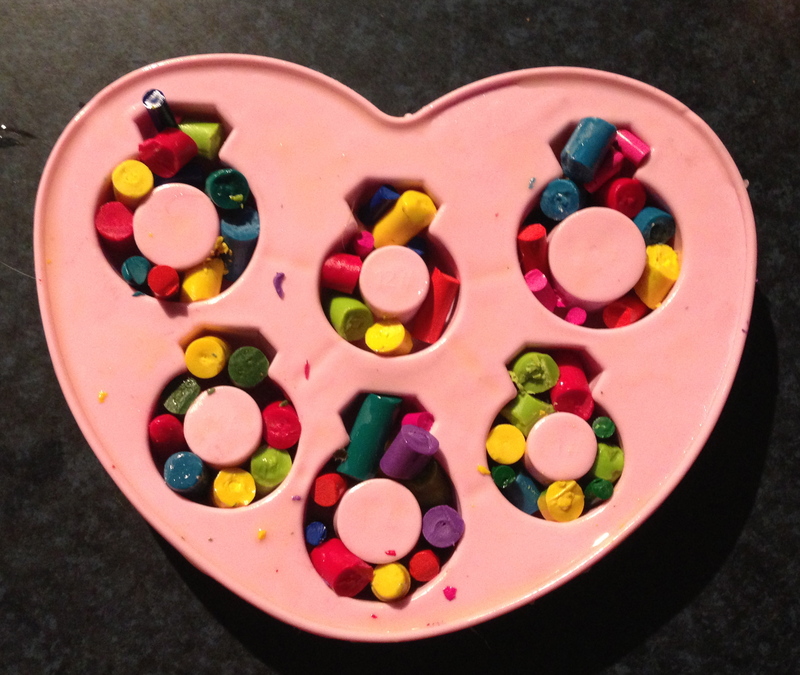 Recycled Cans – Toddler Activity. The hardest part of this project was collecting the cans! To make stacking easier, make sure all 10 cans are the same height. Obviously you don’t need to cover the cans with paper, but I think it made it a bit more fun. I just cut some scrap booking paper to size, fixed with tape, and they’re done. 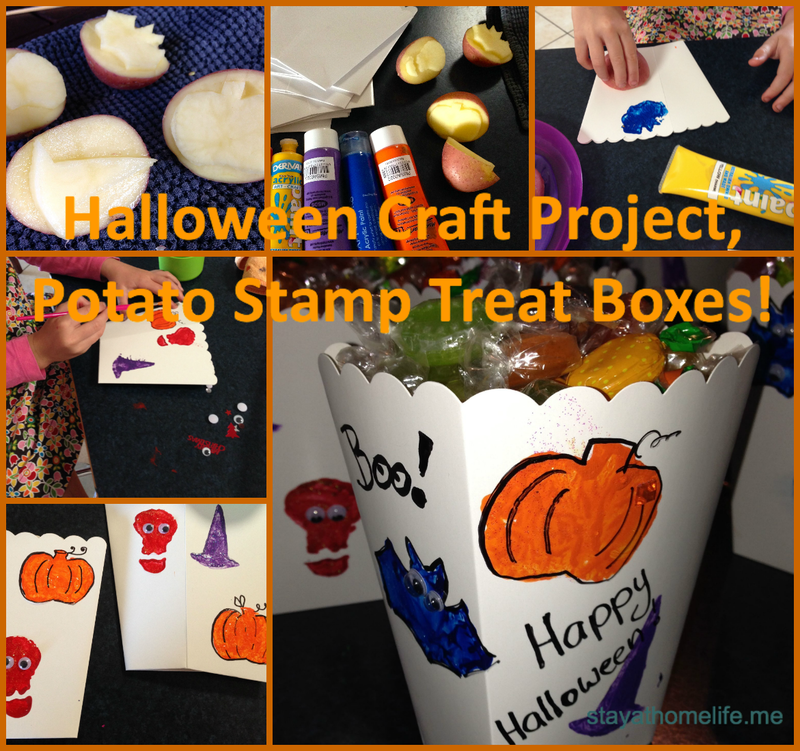 This activity develops hand eye coordination, cognitive and gross motor skills. Once you’ve had enough, the cans can just go into the recycling! The kids loved the noise they make as they smashed to the ground. Older kids could keep score and make a more competitive game out of it. 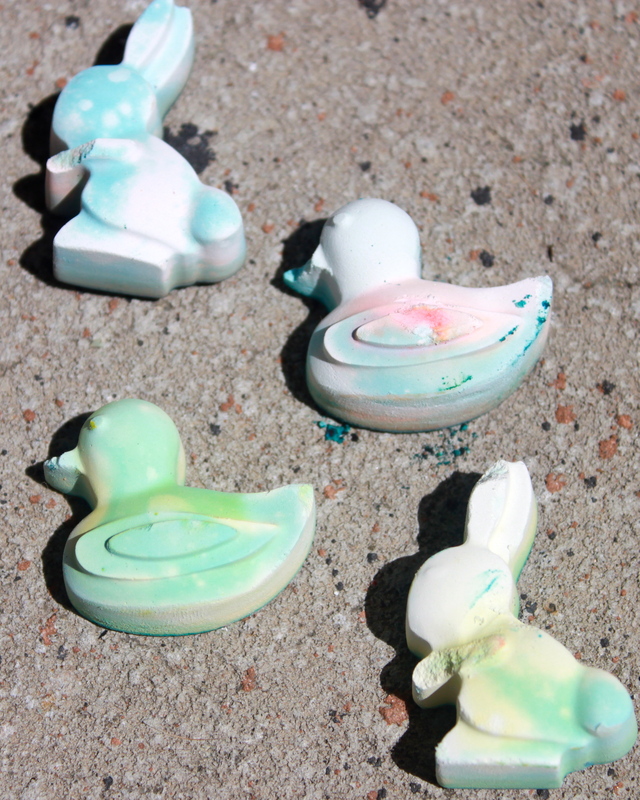 Home Made Chalk with an Easter Twist. I have been going to try out this home made chalk method for a while. When I picked up some new silicone moulds from Aldi last week, I figured it was the perfect opportunity to try them both out! Ideally disposable plastic cups would be the best thing to mix the plaster in, but I didn’t have any, so we just used some plastic cups we are not very attached to (IE, not Tupperware, lol). You can buy plaster of paris from any large hardware or craft shop for around $10 for a 3kg (which is heeeaaaaps, 1kg is more than enough for this project). 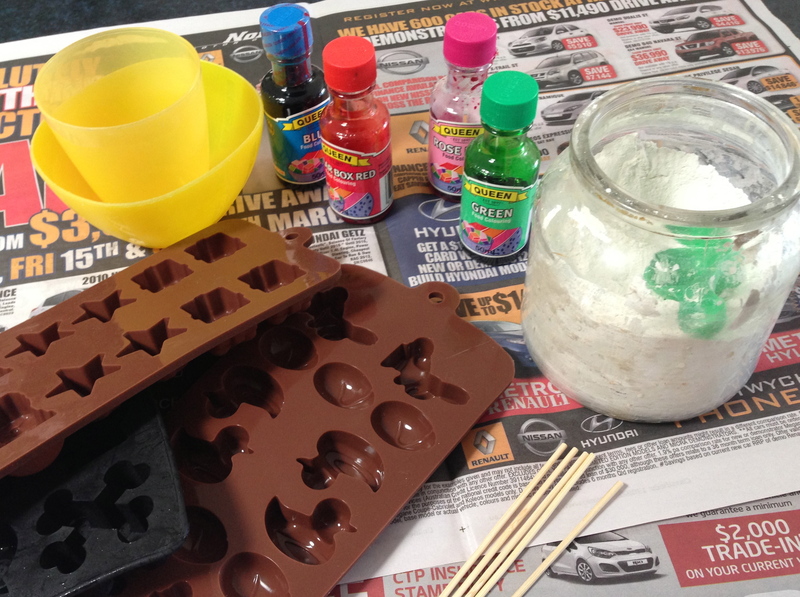 Silicone or rubber ice cube trays, food colouring and something to stir with. 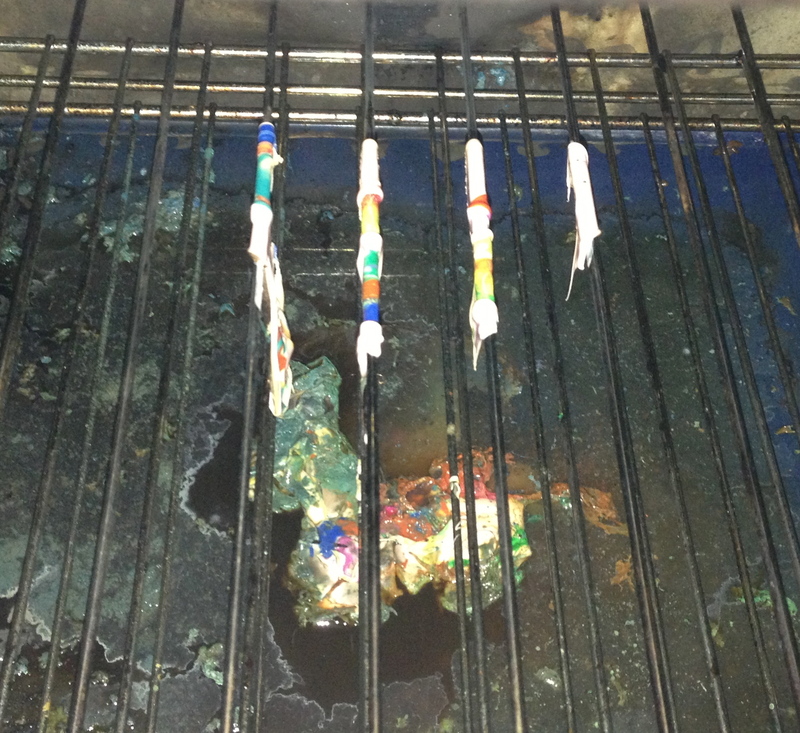 Again, paddle pop sticks would have been better, but these skewers will do the trick. Stir thoroughly, don’t let the mix get too thick so you can still pour it into moulds. Mix the food colouring in the water first, then add the plaster. 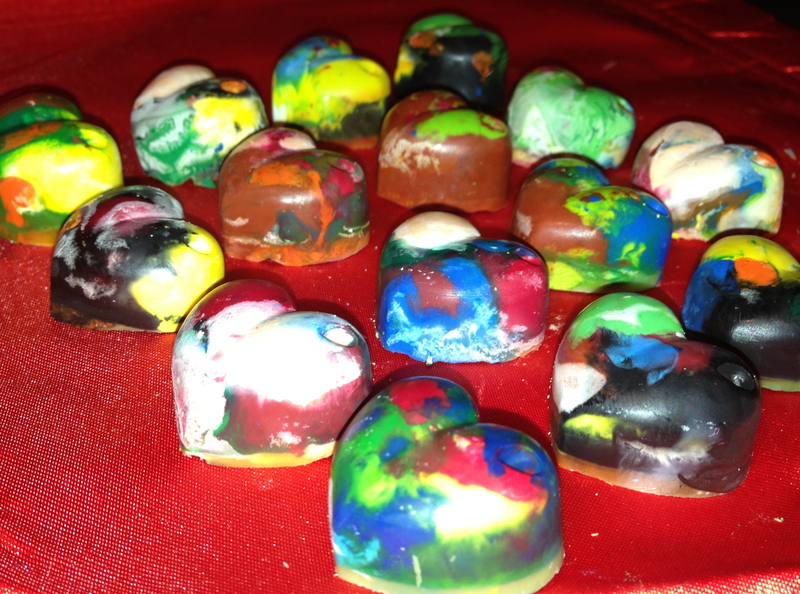 Stir rapidly until its fully mixed, then poor into the moulds. The plaster will set in roughly half an hour, some water may rise to the top, you can just dab this away with some paper towel or tip the moulds after this time for it to run away. Then allow to fully cure in the moulds over night. We also experimented with some glitter in the chalk, for something a bit different. It actually worked quite well, although its really hard to capture the results with the camera. One of the glitter chalks. Then simply turn out of the moulds and get drawing! 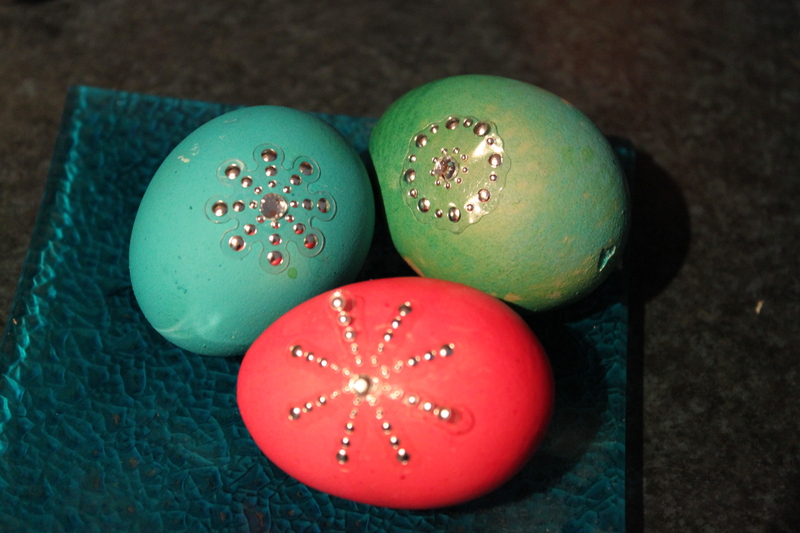 Decorated Eggs, Easter Egg Dying and Decorating. These are obviously pretty straight forward. Dyed in a food colouring/vinegar/warm water mixture. Then a scrap booking embelishment stuck on. Would have preferred embellishments without the clear plastic behind them, but the craft shop didn’t have any like that and you can’t really tell from a distance anyway. I love how these turned out. 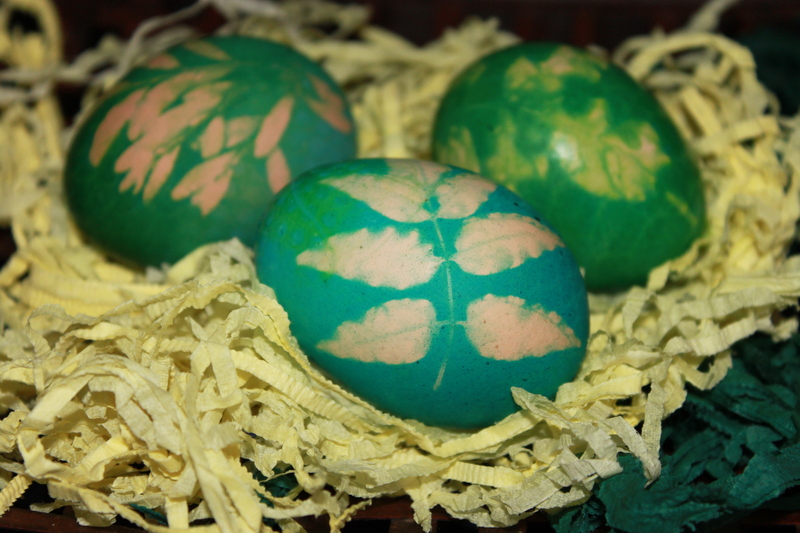 Just use leaves from the garden, lay over the eggs then cover with a stocking or pantyhose. I actually used some stocking I had on hand and didn’t even need to ruin them in the process. Dip dye for a few minutes and you’re done. We actually discovered this dying method accidentally. 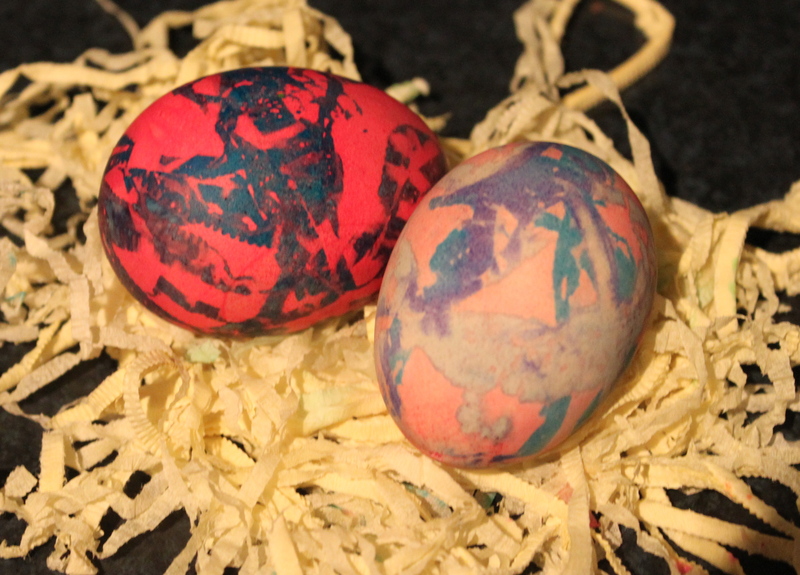 After we had finished the Tie Dying from a previous post, we placed the eggs on this pre shredded crepe paper. Some of the eggs still had a bit of water in them from the boiling process, so when that ran out and wet the paper, the colour transferred onto the eggs! So I took it a step further, wet a hand full and covered them in it. The results are pretty cool I think! The dying solution we used was 3 parts hot tap water to one part vinegar, with as much food colouring as you wanted, we only used about a teaspoon per large cup. 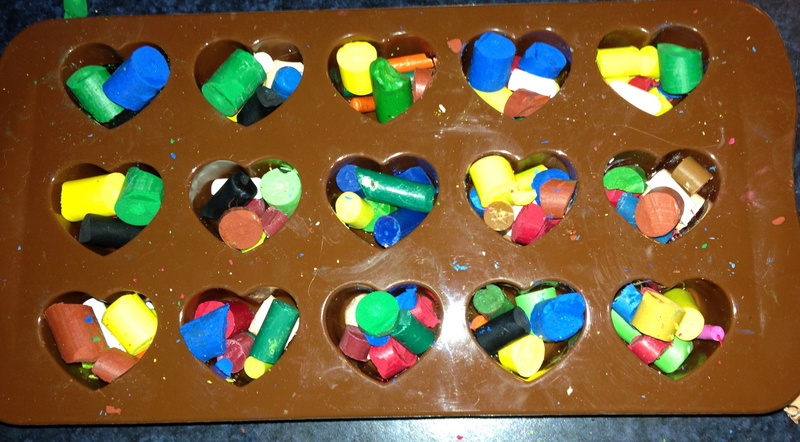 Some of the other patterns we created can be seen below. Some foam stickers to create patterns where the dye cant reach. Trying to keep the eggs afloat to only colour one side – not very successful!